More cautionary tales from the Master of Squeam! These new stories are not to be missed. Visit The Hothell Darkness and let The Night Night Porter tell you a few tales from his Visitor’s Book. Read in horror as a lazy girl in a sleeping bag transforms herself into a witchetty grub, as a fashion victim tries on his own skin, as the Weather Witch kicks up a storm, and a Bugaboo Bear takes its glassy-eyed revenge on its not so-loving owner. Cringe when obesity explodes over the TV camera, when statues come to life and plants eat flesh. Meet the ugliest prince in the Universe, a wastrel who is recycled by Recyclops and the girl with a face full of bees! Paperback (ISBN 978-1-84255-549-1) Buy Now! Paperback (ISBN 978-1-84255-550-7) Buy Now! Paperback (ISBN 978-1-84255-551-4) Buy Now! Paperback (ISBN 978-1-84255-552-1) Buy Now! Paperback (ISBN 978-1-84255-553-1) Buy Now! Paperback (ISBN 978-1-84255-554-1) Buy Now! Paperbook (ISBN 978-1-84255-647-4) Buy Now! Paperback (ISBN 978-1-84255-648-1) Buy Now! (ISBN – 978-1-4440-0012-2) Buy Now! Originally there was Grizzly Tales For Gruesome Kids which won the Children’s Choice award at the Smarties Prize in 1990. Getting a haircut? Eating spaghetti? Having a birthday party? You may think these all sound like very ordinary things to do. But read on and see how GRIZZLY they can really be. Includes The Spaghetti Man, Glued To The Telly and The Barber of Civil. From spooky school dinners to the grubbiest ghost in the world, here are fifteen scary tales full of ghostly, ghastly, gruesome goings on. So if you like to send a shiver up your spine, read on…if you dare. Includes Grandmother’s Footsteps, The Tangled Web and The Locked Door. What terrible cure lies in store for the girl who feigns illness when it’s time to go to school? And what about Serena Slurp, the greedy guzzler who can’t stop gorging? Or Johnny Bullneck, the bully who gets his fingers burnt (and more!)? And Bessy O’Messy, whose bedroom is like a bomb pit? Or Well’ard Willard who tells his last lie and doesn’t live to regret it? Grim and ghastly fates await fiendish kids with terrible habits. Are you a day dreamer? A bad loser? A nose-picker? Nothing wrong with that, you might think. But read on and see how GRIZZLY they can really be. Includes Revenge of The Bogeyman, The Upset Stomach and Bunny Boy. All four books have gone out of print, but don’t worry. You can still buy the books online and your local library will definitely have copies. 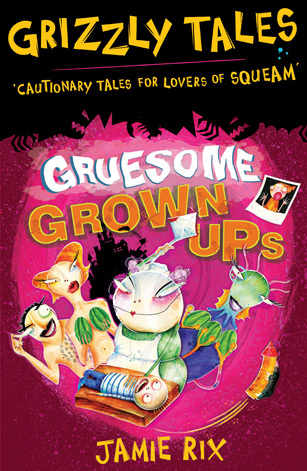 Jamie writes, co-produces and co-directs Grizzly Tales for Gruesome Kids which is an award-winning animated series of cautionary tales (two British Animation Awards and five times BAFTA nominated) that started on CiTV and is now shown daily on Nicktoons. Over 104 stories have been animated so there’s no excuse not to have seen it! As well as winning all sorts of prizes, Grizzly Tales for Gruesome Kids has had one or two nice things said about it as well! This DVD is scary! The producers accept no responsibility if children are forced to watch it from behind the sofa!